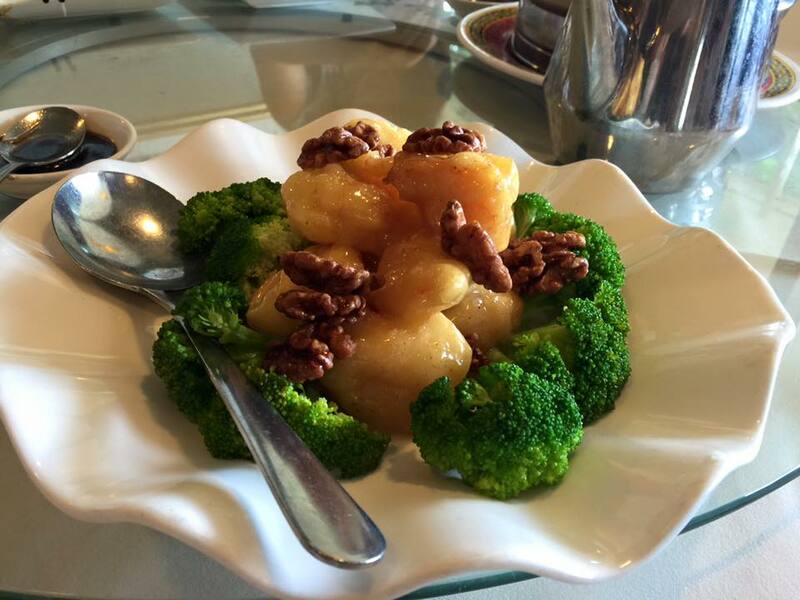 I went to a Chinese lunch (Shanghai food to be exact) in Princeton, NJ with a group of WeChat enthusiastic foodies this past Saturday. I kept wondering what could be really happening in the food scene there, a family town that attracts professionals with families due to its good school system and an Ivy League university. 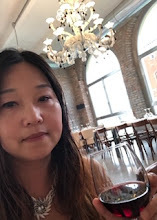 When I got to this unpretentious Shanghai restaurant (Shanghai Park), which is located across the hardware store, Ace, in the down-to-earth Princeton Shopping Mall, I told myself, OK?! Am I walking into a DMV office? Of course not, I saw the big red lantern hanging at the entrance! Be open-minded and never judge a book by its cover! For $20 I was paying for this lunch, I got nothing to lose. It was a no brainer! Well, to start, one of the appetizers was the sweet dark soya sauce scrap fish. The fish was fried first and then cooked with dark soya and sugar. The key to this dish is to make it crispy outside, soft inside and most importantly of all, not greasy. This fish dish really spiked my interest, as it was extremely succulent. The entrees were brought to the table fast, and were served along with the appetizers, family style. This walnut shrimp was coated with light batter before being deep fried, and was glazed with honey. The family style made it easier for us to taste a piece of everything without overly stuffing ourselves! Compared to the soya sauce scrap fish, I even loved this "water-cooked" tilapia more. 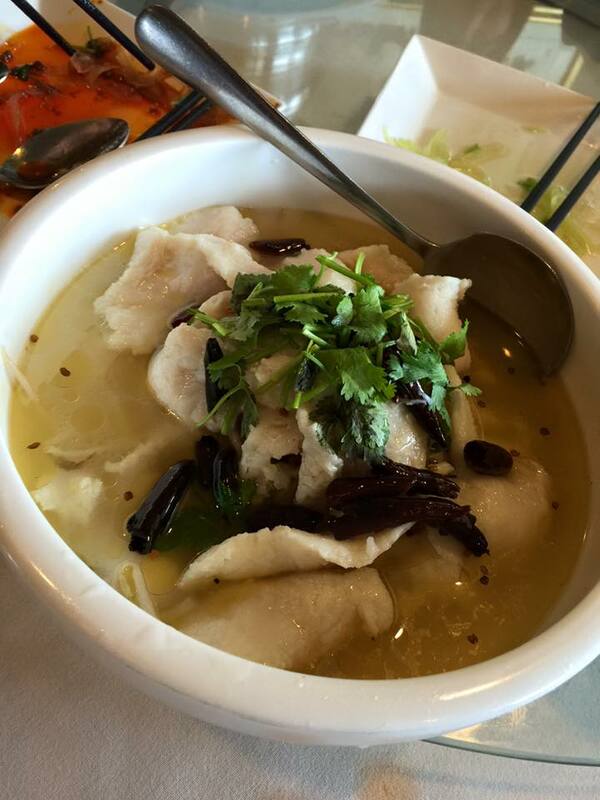 The fish was tender with a hint of spiciness, infused by the red chili pepper and Sichuan peppercorns. These peppercorns have a bit of licorice favor to them that leave a small tingeing sensation on your tongue. I have seen a lot of American chefs using them to cure salmon, due to its distinctive and noticeable taste! I can't imagine eating all this good seafood without a sip of my new Summer love, this beautiful Virginia Rose. This 2014 Glen Manor Rose is named after the Morales family, who have been working in the Glen Manor vineyard for a long time. The Rose is aromatic, fruity but has some weight, which is very delightful with flavorful cooked seafood. Moving on to another all time Shanghai favorite, the thinly sliced beef tenderloin with soft ligament ... this is a spicy appetizer that uses hot chili oil and Sichuan peppercorns. You probably get it now that this "hotness" combo is spicy and tongue-numbing in a good way. 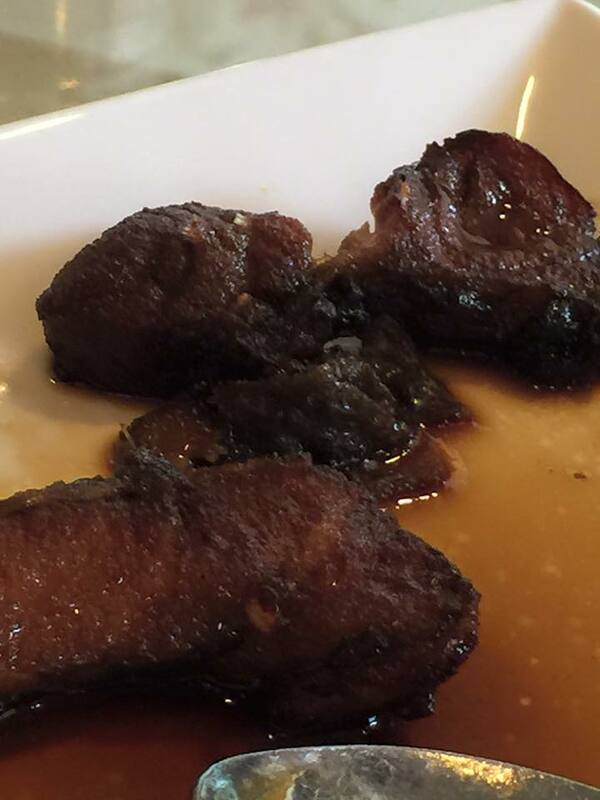 The highlight of this Shanghai lunch was the pork belly slices cooked in Chinese preserved vegetable. The fat of the pork belly has been rendered, which showcased the leaner meat tanned with the beautiful molasses color of the dark soya sauce. It looked and tasted so succulent that each slice was a perfect balance of fat and meat, a taste of heaven. 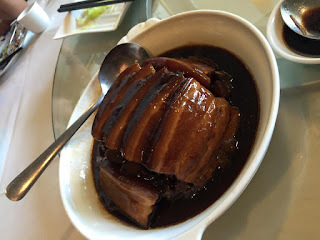 The preserved vegetable was layered underneath the pork belly to absorb the yummy pork juice. Unlike vinegar-based pickle vegetable, the Chinese preserved vegetable is cured by salt and sugar, and develops mineral and earthy favor as it ages in clay containers. 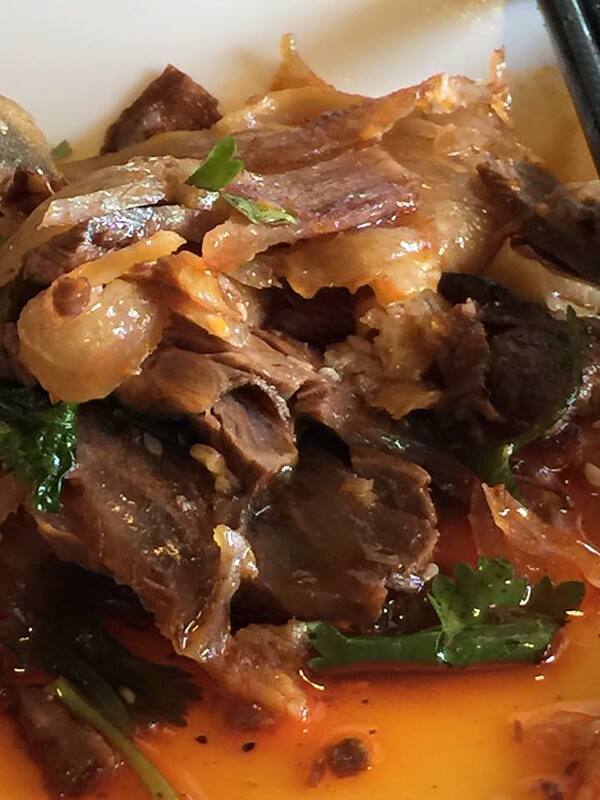 It enhances the favor of the meat by making it richer and more complex in taste. The charming Linden red from Virginia is all I can think of when biting into this pork belly. This 2011 Red blend is a great wine made by the low-key Virginia wine pioneer, Jim Law, who makes quality wines day-in day-out in the mountainous Northern Virginia, impressing visitors near and far. It is light to medium body and dry enough to cut the fat in these meat dishes. The dishes that were served in this little gem in Princeton, Shanghai Park, were solid authentic Shanghai food that totally "wowed" all the Chinese foodies (including some Shanghai originals who got to taste their "soul food"). 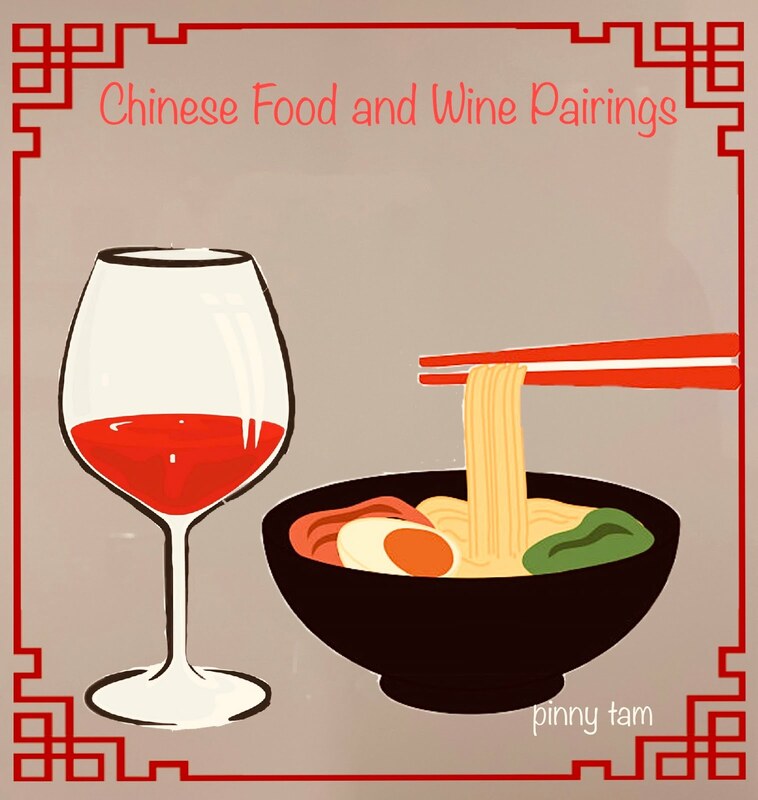 The chosen Virginia wines go amazingly well with this Shanghai food as they are uniquely versatile and handle the complexity of Chinese food well. Most interestingly, they both are little gems that serve big taste.